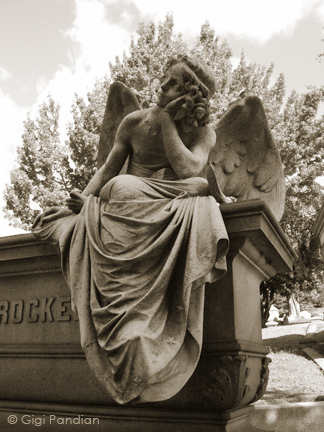 Mountain View Cemetery is a beautiful cemetery in Oakland, California. Sharing a similar ethos to London's Abney Park Cemetery, Mountain View was created with the vision of being balanced with nature. The cemetery park gardens were designed in the 1860s by landscape architect Frederick Law Olmsted (designer of New York City's Central Park), who created twisting walkways lined with trees. You can't help but feel peaceful wandering along those paths on the sloping hillside. 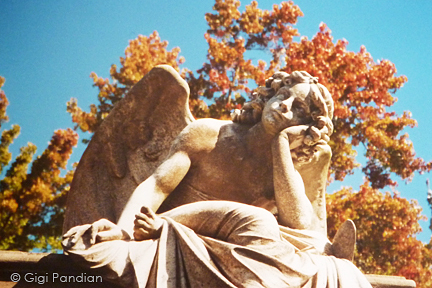 My favorite angel at Mountain View cemetery in autumn. 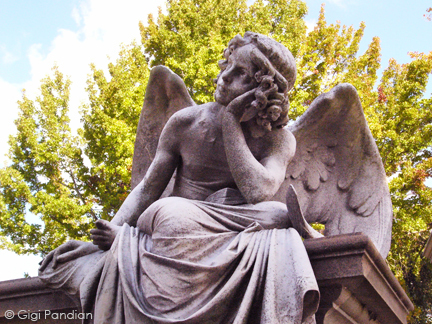 Views of the angel in spring.